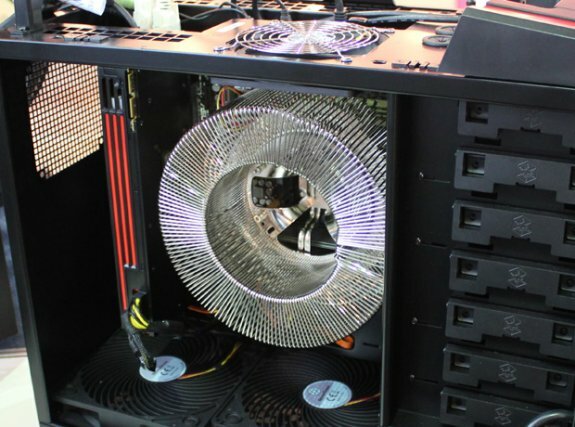 The Tech Report found a photo of a fanless CPU cooler that's being sold in Japan. The cooler doesn't use traditional cooling fins, the design looks like bent bicycle spokes but it promises to be able to dissipate up to 100W. Looks like the cooler, dubbed the CR-100A, will cost nearly $500 when sold in a kit with a NOFAN case and PSU, neither of which have fans. Duh! Rather than using cooling fins, the CR-100A relies on what look like ornately bent bicycle spokes to conduct heat away from a system's CPU. The cooler is said to support processors with TDP ratings up to 100W, which includes all of Intel's Sandy Bridge models. Good luck finding a case that'll fit the thing, though. The CR-100A measures nearly nine inches in diameter, is just over five inches tall, and weighs close to two pounds.